U.S. cities are currently undergoing unprecedented growth. Facing unique limitations, including a lack of resources—limited land, water, electricity, and transportation— cities must increase these resources to support the growth of the population. Eight years ago, the world’s population was evenly split between those living in urban areas and residing in residential areas. By 2050, it is projected that the world’s population will to be two-thirds urban, and one-third rural. This continued growth will likely lead to difficulty in providing affordable housing and building a sustainable city. New York City and Boston are cities currently in the midst of an affordable housing crisis, and both are working with public sector urban planners and private sector developers to get ahead of the challenges that come with supporting a mass migration. In New York City, where resources are restricted and housing is at a premium, conserving resources, reducing carbon emissions, and being energy efficient are attractive qualities for potential residents. Speaking at last year’s Urban Land Institute Fall Conference, real estate developer Rob Speyer spoke about the need for developers to recognize these factors, and make plans accordingly – ensuring that structures are both energy efficient, while making the best possible use of space. Speyer cited Rockefeller Center in New York City as an example. The Center uses green technology, like rooftop solar panels, and also cuts down on the need for transportation by providing shopping, entertainment, and office space in one location. In Boston, another major U.S. city faced with rapid population growth, work will begin this year that will turn a concrete parking garage into a residential and office tower. The new structure will include a one-acre green roof, providing a “yard” in the heart of the city. 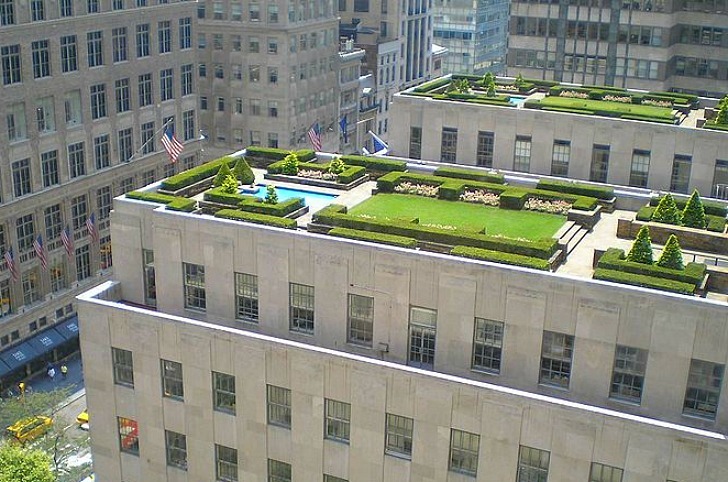 New buildings in cities are now designed to utilize any space they can to provide “green space”, including roof decks, “yards,” or urban gardens. These spaces provide outdoor space not often seen in a city, while improving air quality, reducing pollution, and decreasing the carbon footprint of the building. The redevelopment of the Government Center Garage will reuse a portion of the existing garage and will strive for LEED Gold Level Certification. This project will also serve as a more sustainable transit option, integrating with the MBTA’s station. Projects in both New York City and Boston provide just a small glimpse into the current movement towards more efficient and sustainable urban centers. In order to accommodate the projected growth in the majority of U.S. cities, public officials and members of the private sector must band together to bring positive change and create smart plans for urban development. Through continued advances, these cities will lead the way into a more sustainable future. This is all good but in New York and probably in Boston also the costs of building new housing and renovating existing housing are so high that the for profit industry cannot increase the amount of affordable housing. A friend of mine owns a seven unit brownstone in Brooklyn Heights. He had a one bedroom apartment come off rent control when its elderly occupant moved. He renovated the apartment and sought new tenants at a rent of $ 2900 a month. He had new tenants in about one hour who were absolutely delighted to get it for as little as $ 2900. Then there is my niece and her husband, also in Brooklyn. Their combined income is around $ 400,000. They tried to buy a three bedroom co-op or condo in Brooklyn for under $ 900,000. It doesn’t exist. You can respond that Brooklyn prices and rents are high because of the high demand but high demand is what for profit builders need to make money and the demand in Brooklyn isn’t high enough to make affordable units profitable.